Three political science students at the University of New Brunswick in Saint John want to make a positive impact on the world around them. Thanks to their high academic performance and financial support from the Sandra Irving Scholarship, they’re well on their way. 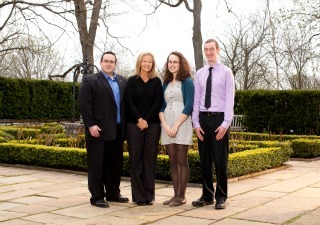 Peter Conley, Natalia Hicks and Adam James Reid have each been awarded $5,000 to help achieve their dreams. “This scholarship will help each of these outstanding students pursue their ambitions,” said Debra Lindsay, chair of the Sandra Irving Scholarship selection committee. Peter Conley, a second-year student, wants a career in education or law enforcement following his Bachelor of Arts degree so he can make a valuable contribution to his community. As a student of both history and politics, Peter realizes what great potential there is in Saint John and sees himself as an active participant in the future of our city. Natalia Hicks, a third-year student, plans on applying to the Masters program in the near future. Discovering how and why the world works through studying political science has given Natalia a unique outlook on the world, leading her to a career in the non-profit sector. Adam James Reid, an honours student and father, plans to pursue a graduate degree in political science focusing on international relations. With the Sandra Irving Scholarship to help support his studies, he hopes to set a good example for his children. The Sandra Irving Scholarship is awarded annually to political science students at UNB Saint John. The selection committee looks at academic standing, career aspirations and a personal statement in making their decision. The $5,000 scholarship is named for the donor, a UNB Saint John political science graduate who created the award. Students at UNB Saint John are generously supported by a number of scholarships and bursaries like the Sandra Irving Scholarship. Learn more at www.unb.ca/scholarships.